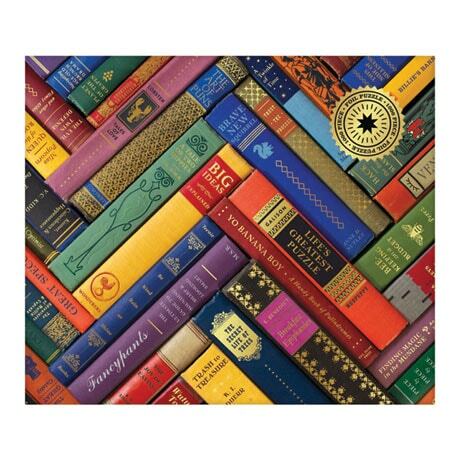 Indulge your passion for books even when you're not reading as you while away the winter hours with our 1,000-piece Vintage Library Puzzle. A colorful collection of vintage tomes—in vivid shades of blue, yellow, red, and green, with gold foil accents on the bindings—fit snugly together in a makeshift chevron pattern. With titles such as A Tale of Two Hippies, Brave New Squirrel, Planet of the Grapes, and Navigating Age-Old Brunch Drama, you're bound to enjoy a chuckle or two as you work! Measures 20"x27" when complete.